Our companies are able to set up durable and approved indoor and outdoor play sets and play structures. Please find these examples available for download. 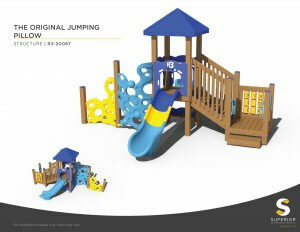 Download the SPI Outdoor Play Products Catalog here. Whether it’s playground components your organization or company needs or you are building a full new city park, you will find that playground equipment by SPiPlay to be the best choice in outdoor playground equipment for children. * It carries a 10 year warranty on all of their products. *It is modular and easy to install. *We offer a wide range of playground systems. Every imaginable Play Set, accessories and components. Outdoor Basics for the Budget Conscience Buyer.